How I overcame the FEAR of starting of an online business | BytetoDC . In December 2016, I was feeling that I need to get out of the 9-to-6 grind even though I was already working from home. 2 redundancies in 3 years, I wasn’t optimistic about the future of being a salaried employee for any organisation under the sun. My research for ways to make an online income led me to the idea of becoming an affiliate marketer. However, I didn’t think I would succeed, and the fear of losing time and effort weighed heavily on me each time I thought about it. In my circle of friends, I know of no one who is doing any form of internet marketing. Therefore, I kept the plan to myself and determined that I would work this out over time and not let any person or circumstance pull me off-track. I likened the fear of starting an online business to that of a boxer’s fear of being punched. A punch no matter where it lands – it hurts. Scarier than the pain is the unpredictability of where that punch will come from. When I first began investing time and a bit of money ($49/month) in learning how to create an online business, I was like the boxer. I feared being “punched” with an immediate KO (failure) and losing my investment. I also fear where that KO punch will come from. Will it be due to a lack of social network, a wrong strategy or an overly competitive niche? The list of concerns goes on. Nevertheless, one day, I decided to jump in. “Never let the fear of doing something become your regret for life.” I thought to myself. With that, I threw my first punch and went into battle mode. Though I have never boxed professionally except for a few training sessions at Muay Thai, a boxer (No, it’s not Mike Tyson!) once confessed that prior to every match, he goes in with fear. Yes, the fear of being punched is there, even though he has already been through countless battles. However, once the first punch connects, he just immerses and executes without worrying a bit. Emotionally, he becomes less tense and is able to focus on the task ahead – to KO his opponent. Such is my experience starting an online business. There was so much fear prior to doing it. However, once I start, the rest just flows along and even though punches continue to come my way, the mind and body just defray them naturally and keep moving forward. 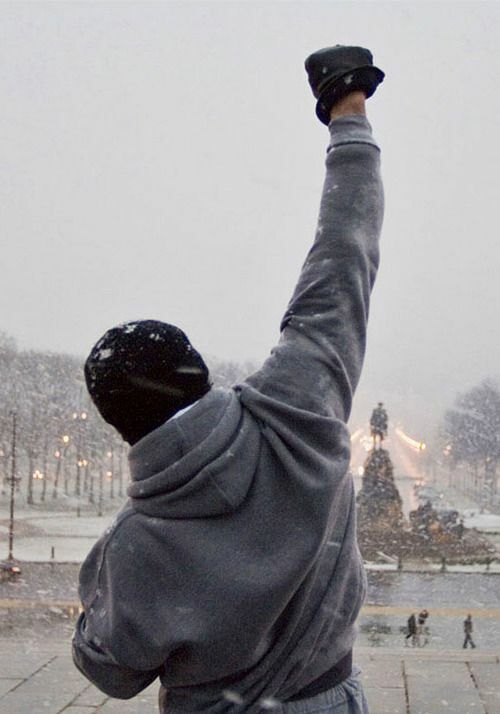 Some of you recognise this famous quote from the movie Rocky Balboa played by Sylvester Stallone. I can’t think of a more apt quote than this in describing the mentality one should have to succeed. It is not just in online business but basically anything in life. I had my share of ups and downs, more of the latter actually. Nevertheless, the occasional ups gave me the encouragement to keep moving forward. With every hit, I tell myself “I am one step closer to my goal.” Of course, prudence should be exercised over this. To keep moving forward does not mean to bulldoze headlong into something without reflecting what has worked well and what hasn’t. Every successful entrepreneur found a way that works well for him or her. I figure I have to do something unique to differentiate myself and then that will be my path to success. It is possible for everyone to differentiate himself or herself because we all bring unique experience to the same game. I came into this anticipating it won’t be smooth sailing and that hard work is just a basic pre-requisite. I have seen and heard a lot of internet marketers. They are very successful. People like Richard Brunson (“Expert Secrets”), Tim Ferris (“4-Hour Work Week”), Pat Flynn (“SmartPassiveIncome”) and many others are so good at internet marketing that it is often overlooked that behind their success lies all the hours of effort. I ask this question to myself constantly. Are you willing to work that hard? If not, it is a dream to think that success will come knocking my door just because I bought into a system of making money online. Granted that information is more readily available nowadays and with the internet and some investment for courses, you can understudy the methods others have successfully implemented, so that there is no need to reinvent the wheel but there are also the ingredients of hard work, focus and consistency. I work long hours each day, juggling my day job as a recruiter and then the after work duties of being a dad to my newborn, before squeezing out precious and highly limited time to work on my online business. Every moment counts. I begin each day at 5 am and I end at 12 midnight. This is my daily routine. Some say it is spartan but this is my commitment to success and no doubt it is tiring. But it is also absolutely invigorating because I am motivated and do not want to be trapped in a corporate role for the next 20 years. I realise the lack of a plan puts people in anxiety. If there is no plan, it means I am just going in with a HOPE. This causes anxiety and often results in real losses as well. I was having a difficult time overcoming the inertia of starting my online business venture. After much research, I basically have it down on what I want to pursue – affiliate marketing. But I couldn’t pinpoint why I hesitated and delayed for so long. Then one day while journaling down my thoughts over this, I see on the paper in front of me, the answer staring back at me. I don’t have a plan for the business. What do I mean by a plan? It means what I should do day to day and how much time I should allocate and to what activities. Without a plan, my mind was just running around in circles and getting exhausted by the numerous possibilities to the point I cannot bring myself to do anything. Once my plan was in place, I had the confidence to start because I have already considered all the corners to the best of my ability and the rest is execution. Is there REAL help without someone trying to sell something to me? Is it just me? I had the feeling every website I found was trying to solve my problem by selling me something. My first encounter was a product for $17, only to find that it immediately tried to push other products to me (Common upsell technique). As you can see, I got off to a bad experience and I was sceptical of internet marketers who tout their products to help me create an online income. Thinking this way, the future looked very bleak. It took me a while before I can re-calibrate myself. I am trying to learn how to start an online business. There are free resources on the internet and then there are paid courses which serve to ‘shortcut’ the process by having resources organized systematically to enable the reader to follow through. For their effort, these resources deserve to have a price tag on them. There is nothing wrong with charging others for the services/products we provide. Once I thought this through, the clearer question was to identify which are scams and which are not. Not every high-priced product is a scam and vice versa, though the market has seen its fair share of highly priced SCAM-Y products. There is no quick fix for this except to research product reviews before taking up anything. I did that and in March 2017, I found what I think is the right course and business opportunity. It is known as Wealthy Affiliate and if you can relate to what I went through, I recommend you review Wealthy Affiliate. It would be worth your time. Real help does come with a price. To me, the definition of real help would be practical assistance that really value adds and leads me closer to my goal. I think this is fair and all I look for is transparency. Shady marketing turns me off immediately. This is my last advice. You have jumped in, started your online adventure but things are not working out. It’s been weeks or maybe months already. However, you are on the path to creating your financial freedom, it’s important for you and your family. Then, the reward itself is worth every effort you put in. If you ever stumble, don’t lie down. Get Up and give it one more round! This article is based on my personal experience. Is it relevant to your situation? What is your experience on overcoming the fear of starting? I love to hear from you.